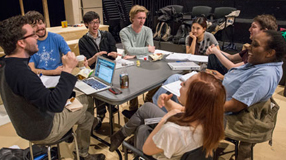 Student actors work with a leading professional company to test their creative limits. A panel examines former Chicago mayor Harold Washington's legacy on the 30th anniversary of his historic election. Birds that continue to display their plumage to each other after forming a mating bond show a greater investment in their offspring. The mobile-friendly redesign of uchicago.edu is recognized with two of the awards known as "the Internet's highest honor." To his three sons from three different wives, Saul Bellow, X'39, "was like a giant redwood that we experienced at different times of his growth." The University's ten-year, $3 billion capital building plan takes some inspiration from Burnham and Olmsted, emphasizing architectural and natural beauty. "The differences are quite dramatic," behavioral economist Richard Thaler says, when workers have to opt out of a savings plan rather than opt in. The UChicago economist and Freakonomics coauthor discusses his business and philanthropy consulting company. And it can even be dangerous, says Law School senior lecturer Richard A. Posner. Geneticist and associate dean for global health Funmi Olopade speaks as part of Pritzker's "Big Ideas in Medicine" series. Join alumni from across the University for many family-friendly events. With great food and a variety of entertainment, the barbeque is sure to be one of your favorite events of the weekend. Rachel Shteir, AB'87, lists her top five.